Widely honoured for his work in biochemistry, which included the investigation of vitamins, enzymes and the constituents of cannabis, Sir Alexander Todd was awarded the Nobel Prize for Chemistry in 1957. His research led directly to the understanding of nucleic acids and Watson and Crick discovering the helical structure of DNA in 1953. Todd became the Sir Samuel Hall Professor of Chemistry and Director of the Chemical Laboratories of the University of Manchester in 1938, where he began working on nucleosides, compounds that form the structural units of nucleic acids (DNA and RNA). In 1949, he synthesized adenosine triphosphate (ATP) and flavin adenine dinucleotide (FAD). "The work has been very comprehensive, and many special methods have been evolved, but it is hardly possible to give a non-chemist a clear idea of the brilliant experimental work accomplished." In 1955, he clarified the structure of vitamin B12, subsequently working on the structure and synthesis of vitamin B1 and vitamin E, the anthocyanins (the pigments of flowers and fruits) from insects (aphids, beetles) and studied alkaloids found in cannabis. He served as chairman of the British government's advisory committee on scientific policy from 1952 to 1964. He was awarded the Nobel Prize for Chemistry in 1957 for his work on the structure and synthesis of nucleotides, nucleosides, and nucleotide coenzymes. He was knighted in 1954 and raised to the Peerage as Baron Todd of Trumpington in 1962. Born 2 October 1907, Glasgow, Scotland. Sir Alexander Robertus Todd, Baron Todd of Trumpington (1907-1997) was a graduate of the University who was awarded an LLD in 1950. In 1957 he won the Nobel Prize in Chemistry "for his work on nucleotides and nucleotide co-enzymes." 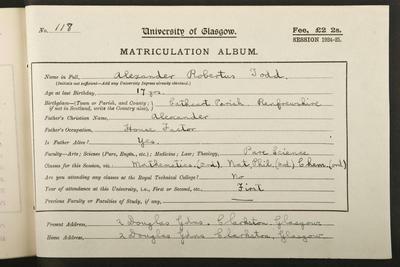 Born in Glasgow, Todd studied Chemistry at the University and graduated BSc with first class honours in 1928. In 1929 he published his first academic paper, with the Gardiner Professor of Chemistry Thomas Patterson, and he worked with Patterson as a Carnegie Research Scholar in 1928-1929. He continued his studies in Germany, graduating DrPhilNat from the University of Frankfurt in 1931, and returned to Britain as the 1851 Exhibition Senior Student at Oxford. He went on to work as a researcher at the University of Edinburgh and the Lister Institute of Preventive Medicine, establishing his reputation as one of the country's leading organic chemists. The University of Glasgow awarded him a DSc in 1937 for his thesis Studies in the Chemistry of Aneurin (Vitamin B1). 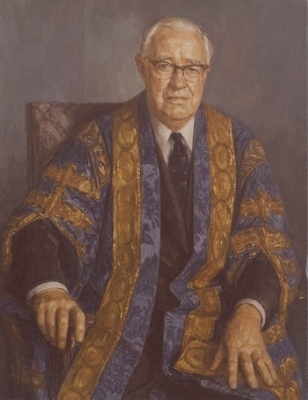 In 1938, Todd was appointed Sir Samuel Hall Professor of Chemistry at the University of Manchester. He went on to become Professor of Organic Chemistry at the University of Cambridge from 1944 until 1971. He was Master of Christ's College, Cambridge from 1963 until 1978 and was the first Chancellor of the University of Strathclyde, from 1965 until 1991. Todd's pioneering work on the structure of nucleic acids laid the foundations for research to establish the general formula of DNA. He was was knighted in 1954 and created a life peer in 1962. Among many other honours, he was President of the Royal Society from 1975 until 1980. Todd, Alexander. 1983. A time to remember: the autobiography of a chemist. Cambridge: Cambridge University Press. World Changing Project, "Work on nucleotides and nucleotide co-enzymes," in University of Glasgow World Changing (University of Glasgow, 2010); http://www.worldchanging.glasgow.ac.uk/article/?id=71 (accessed April 26, 2019). World Changing Project. "Work on nucleotides and nucleotide co-enzymes." In University of Glasgow World Changing. University of Glasgow, 2010. http://www.worldchanging.glasgow.ac.uk/article/?id=71 (accessed April 26, 2019). World Changing Project. "Work on nucleotides and nucleotide co-enzymes." University of Glasgow World Changing. University of Glasgow, 2010. 26 April 2019 <http://www.worldchanging.glasgow.ac.uk/article/?id=71>.